Discussion in 'Forum and Server Announcements' started by BiGUNMAN, Jun 16, 2016. It's been only two weeks since our last article yet so many things have changed, been updated, or are being added/worked on, so lets start! Just take note, these are features that have either been released or will be released in the upcoming week. We added a new payment gateway called Stripe to our store page. The EULA ranks have been fully completed and released. We added "/trails", then we removed them the very next day. We're bringing in a custom /trails feature as the one we added caused lag. Now we're making our own better version! This will also contain a feature mentioned in a previous update that would add animations when you warp. We've added buddy mobs, which are actually unique pets a donor can access, more info below. The Auction House announcement from the previous article has been delayed to at least 2 weeks (sorry, this was unexpected!). Chestshops will be added. Type /chest sell - To add the item you hold in your hand to a chest you're looking at. RELEASED! The ability to use your /coins will be added this coming week. One coin is gained per hour of play. Auctions are back. Their is now a $1000 fee for each auction you start. From previous week it seems their were some technical difficulties with launching this contest, so we're delaying it to June 26th. This means you can enter/register for the contest right now! Do so here. Again, to those who are donors please go here. To learn about the changes that may/may not effect you. 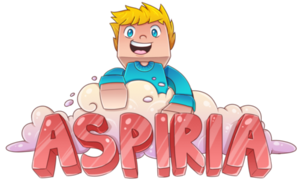 Finally, I'd like to thank you guys for allowing us to continue our Aspiria updates. It's awesome to bring new features to the server so thank you guys, those that have purchased something on our store, and in general all you guys for playing, and creating an awesome server to play on. Enjoy! i love the little buddies lol, this is awesome though! I definitely prefer the pre EULA rank. finally, time for me to get back on this server! HYPEEE!!! No time to take a breath for spending couple hours on Minecraft. When will the head shop be open? Big how many buddies will titan's get? And if there is a way how do we get more? There will be a way to get more buddies, and I need to re-check what Titan gets.